Choosing a healthy breakfast cereal can sometimes be confusing and very time consuming. The cereal aisle is a long one! There are cereals made with refined grains which mean they hardly have any fiber, there are cereals with more added sugar than some boxes of cookies, and there are cereals made with whole grains and bran that can contain an amazing 7 grams or more of fiber. The grains should be whole (e.g. “whole wheat” or “wheat bran,” not just “wheat”). Research suggests those who eat more whole grains are at lower risk of diabetes and heart disease. Fiber grams should be at least 5 grams of fiber. Adequate protein content should be at least 3 grams per serving. Low sugar – each serving size should contain less that 5 grams of sugar. Look for the “five and five” rule: Less than 5 grams of sugar and at least 5 grams of fiber. Zinc content should be 25 to 40 percent of the recommended daily allowance. Iron content should be 25 to 40 percent of the RDA. Other vitamin and mineral content should be 25 to 40 percent of the RDA. Go for cereals with calcium, vitamin D, folic acid, vitamin C and potassium. Count and watch the calories – Remember that you will add milk, fruits, and maybe nuts as well to your cereal bowl. Choose bran – bran helps in making you more full and is good for weight control. Pick cereals that contain less than 10% total fat. There are also ingredients a nutritious cereal should not contain. Check the ingredients list for these and avoid: hydrogenated oils, dyes or artificial colors. 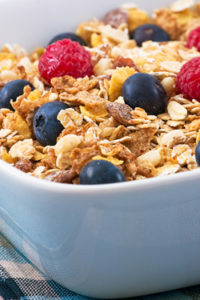 Some examples of some cereals that are whole grain, higher in fiber and low in sugar are: Fiber One Bran Cereals, All Bran with extra fiber, Shredded Wheat, Raisin Bran, Nature’s Path or Kashi Go Lean Cereals.